Once you have been accepted into your host university, you can then proceed with making all necessary travel arrangements (e.g. visa applications, application for accommodation, the purchase of flight tickets), and start preparing for your exciting semester or year abroad. You will have to attend a pre-departure briefing to meet other students going on exchange and gain important information that will help you prepare for your journey. The Monash Abroad Survival Kit is a comprehensive guide to help you prepare for your exchange overseas. 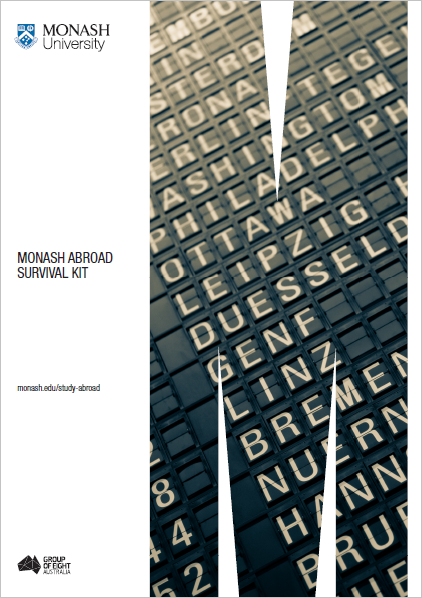 Click on the image to download a copy of the Monash Abroad Survival Kit for your reference.